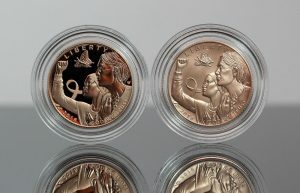 On Wednesday, May 23, the United States Mint could reduce prices on nearly one and one-half dozen numismatic gold products. The U. S. Mint’s collections of gold coins have prices that can change weekly based on the trending value of gold as compared against its 2018 pricing matrix. The agency is currently pricing its numismatic gold coins based on an average of the yellow metal that sits within $1,300 to $1,349.99 an ounce. Since Thursday, gold has been hovering by its lowest price of the year. It is currently trading near $1,292 an ounce. If Wednesday’s LBMA gold price for the PM remains below $1,300 an ounce, then prices of U.S. collector gold coins will drop by as much as $50 for every ounce of the precious metal they contain. The following table summarizes the U.S. Mint’s current and possible gold coin pricing. The U.S. Mint last made pricing adjustments in January — first when gold moved early in the month to above $1,300 an ounce and then again later that month when it rolled out 2018 pricing revisions. Past adjustments have tended to happen on Wednesdays at around 2:00 p.m. ET. This article will get updated with what actually happens. Update: The U.S. Mint reduced numismatic gold coin prices on Wednesday, May 23. The above gold coins are found on the Mint’s website page located here. Yeah they did drop the prices today!